I got this spinach salad recipe from my friend, Sean. He once described this salad to me as being "fierce." It certainly is one of the best tasting salads I've had. I've made this spinach salad - with its tart, sweet dressing - many times for both family gatherings and potlucks where it has always received high praise. BTW: Sean writes about Lesbian/Gay/Bi/Trans issues over at the The Bilerico Project. He's also co-publisher of the DC-based magazine, Metro Weekly, and owner of Ascribe Catering. Ascribe did a wonderful job catering my surprise 40th birthday party on March 14 that was organized by my partner. In a small bowl, whisk together the first 6 ingredients. Toss the dressing in a large bowl with the remaining ingredients. Saw your salad on Tastespotting. 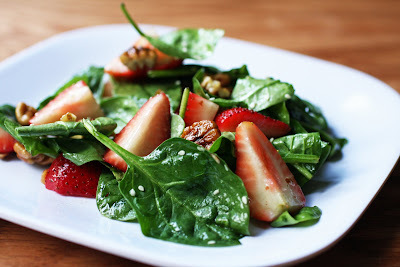 Perfect timing - I was just explaining to my husband last night that spinach salad doesn't necessarily mean bacon and I sited the strawberry combo without having a recipe to back me up. Now I do and we'll be having this in the next few days. Thanks! I really is good, and unusual in that it's rather sweet. @AJ and Kim - when you taste the dressing by itself, you're like, "Damn, that's really sweet. Possibly too sweet." But, once you combine it with all the other ingredients, the sweetness is noticeably cut down (or balanced) because of the slight bitterness of the spinach leaves. I made this yesterday for some friends and I thought I'd have enough to take home. But there wasn't any left after everyone went back for thirds. . . This is a really good salad. Glad it worked out, Wes!